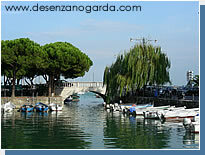 Planning a holiday in Desenzano? The area around Desenzano is thought to have been settled since the Bronze Ages and the long history of the resort can be seen in the archaeological discovery of an important Roman trading settlement beneath the location of the current town. A Roman villa was discovered during building work in the 1920s (now considered as one of the most important examples of a rich merchant's home from the first centuries AD existing in northern Italy) and there is a theory that the name of the merchant ("Decentius") is where the town's name came from. The mosaics and remains can now be visited. The original settlers were attracted to the location because of its position at the junction of east-west and north-south routes in the area. It developed into an important market for the surrounding area and the size of the present town and its status as a popular tourist destination show how those reasons have remained constant through the centuries.. The castello fortifications up on the small hill above the port are probably built on the remains of an original Roman tower. What is visible these days dates from medieval times when the tower provided the strongpoint for the rest of the fortified walls which surrounded over 100 dwellings and a church. 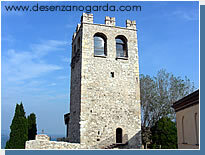 Later the castle was turned into a barracks for alpine troops and now houses a small museum. From the tower there is also one of the nicest views of the town and the lake. 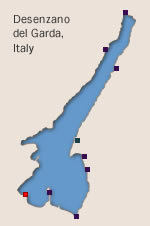 Like most of the other settlements around the lake, Desenzano suffered under the fall of the Romans and the successive waves of invasions from the north. Eventually it came under the control of the Lombards and then the Venetians from their stronghold in nearby Verona. Much of the port area still shows the influence of the grain trade promoted by the Venetian Doges (the name for the rulers of Venice) who turned it into one of the most important distribution centres in northern Italy. The old port of Desenzano del Garda still retains echoes of the era of Venetian control - none more so than the bridge reminiscent of the city in the small harbour near the tourist office (even though this was built in the 1930s! ).The town housed a market where goods could be bought and sold from the fertile area to the south and the mountain communities to the north. The port was also used for shipments around the lake. As well as the bridge in the photo, the Venetian warehouses seen around the port are another reminder of this mercantile history. Desenzano suffered under the wars between the rival powers of France and Austria through the 18th and 19th century. The famous battle of Solferino was fought nearby: a bloody engagement between the French and Piedmontese forces on one side and the Austrians on the other, which led to the signing of the Geneva Conventions and the foundation of the International Red Cross.